Former President Thabo Mbeki’s appearance at the Seriti Commission into arms deal was supposed to shed a light on the top official’s role in the scandal. It didn’t. Instead, it shored Mbeki’s defences. Then it got sad and weird. By GREG NICOLSON. Mbeki’s slight frame leans forward on the table. Both hands are on the desk. His eyes focus on the speaker. Grey-haired and calm, he looks and speaks like a renowned statesman. Mbeki calmly tells the commission that the R30 billion arms procurement deal was a culmination of a process that included assessing what the armed forces needed and looking at options and affordability. It was all above board and in accordance with the Constitution, which mandates the state to provide for defence. The Arms Deal Commission, under the leadership of Judge Willie Seriti, was established to investigate whether that claim is true. There’s a lot to suggest it’s not. As deputy president when the procurement process began, president when the deal was signed, and president when allegations of corruption and maladministration emerged, the proverbial buck stops with Mbeki. Advocate Paul Hoffman cross-examines Mbeki for the day. The first thing he does is say that he will call him “Mr Mbeki” as he prefers Nelson Mandela’s choice not to be called “former president”. Hoffman represents Terry Crawford-Browne, who has fought for years for those responsible to be held accountable and for the contracts to be terminated. His decision to take the matter to court is seen as the reason President Zuma announced the current inquiry. Trevor Manuel, Mosiuoa Lekota and Alec Erwin sit together in a row behind Mbeki’s right shoulder. Mbeki’s then finance minister, minister of defence and trade and industry minister were key government leaders involved in the deal. Only former Defence Minister Joe Modise, who passed away in 2001, is missing. Mbeki agrees that in 1996 the armed forces wanted a balance between the Reconstruction and Development Programme, which prioritised delivering basic services, and military needs. South Africa also had an obligation to the rest of the continent, he adds. 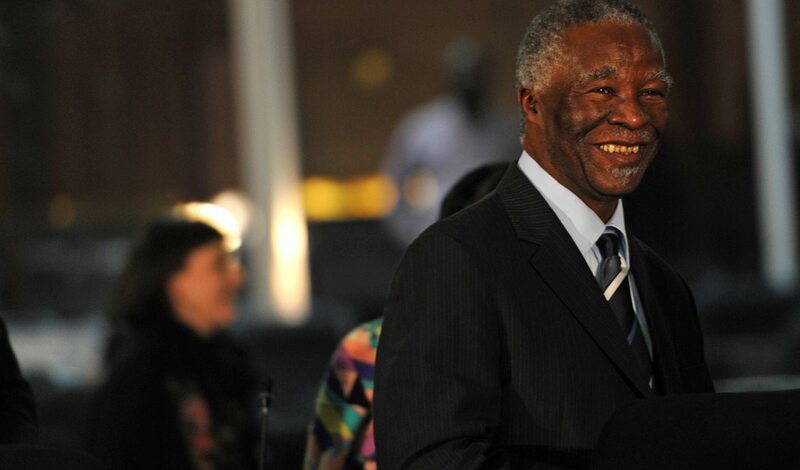 “We never did while I was sitting in government check on the operation [of what was bought],” Mbeki replies. The Commission, hosted in the City of Tshwane’s chambers in Pretoria, develops into a quarrel of objections and accusations. Hoffman is accused of being condescending. He suggests officials were being moved to make the deal with preferred arms dealers and that the committees tasked with assessing the bids ignored their own findings. In 1997, Mo Shaik was appointed as the country’s first consular general in Hamburg, Germany, home of a company involved in the arms deal, for only three months, says Hoffman. Why? “Who goes to which capital, what car do they drive, what shoes do they wear has nothing to do with presidents,” says Mbeki. Hoffman’s attempts to establish that Joe Modise, linked to allegations of corruption, was the former president’s “kingmaker”, therefore tying the two closely together, is blocked by Seriti, who regularly objects to Hoffman’s line of questioning and at times almost invites Mbeki to say what he keeps saying: he doesn’t remember or doesn’t know. The events were over 15 years ago, after all. It was Modise who announced a new three-tier tendering system, which would reopen the process to bids from companies like BAE that had been previously excluded, says Hoffman. It was Modise who is alleged to have been outraged when BAE’s Hawks and Gripens were rated the lowest on the shortlist of tender applicants and it was Modise who allegedly said a “visionary” approach is needed in awarding the tender, meaning the costs should be ignored. Yet it is Mbeki giving a testimony and Hoffman fails to ask questions he will have had to answer. “There was no possibility to sit and take decisions without asking the question, ‘How much are you going to pay for it?’ I think it’s straightforward, unless I’m stupid,” the former president says. Other stages in the process might have skipped the element of cost, says Mbeki, but the inter-ministerial committee and cabinet looked at affordability. Hoffman is moving the conversation to accountability. “Erwin’s blood pressure has gone up,” he says, using a jovial tone. The former minister shakes his head. Manuel leans back in his chair. Lekota is hunched over the desk, hands clasped. If a cabinet member adopts a “visionary approach” that ignores costs, it would be “deeply, darkly unconstitutional”, says Hoffman. “Let’s get to the question. We all know what the Constitution says. The former president knows what the Constitution says,” Seriti interrupts. Hoffman persists. This answer may determine “whether we are participating in a farce or whether we are trying to get to the truth”. Hoffman continues, “Mr Mbeki, I beg you. Think about it what have we done, what has your cabinet done?” He says the SAAF didn’t want the jets we bought, they’re not being used, and some reports say the arms deal has cost the country R70 billion in today’s terms. Hoffman is ignoring the evidence, say other lawyers. They have after all heard from many witnesses on the matter. “I’ve been insisting that the inter-ministerial committee and the cabinet didn’t ignore anything,” Mbeki holds his point. Hoffman proceeds, but his questioning gets caught in emotion, lost in objections, and confused by interruptions. There’s debate on debate. Mbeki looks frustrated and is shaking his head, moving in his chair. He takes offence at some of Hoffman’s comments, which include telling Mbeki he should have been better prepared; his reference to state workers as minions; Modise being called a kingmaker; and the suggestion that Mbeki needs time to cook up a story. Hoffman spends more time making statements than eliciting answers. For most of the day, Mbeki sits silently. Hoffman rattles off allegations of a worldwide corruption scandal but doesn’t do enough to get Mbeki to answer, or in most cases even have his questions allowed. He gives Seriti, who already seems hostile to the position of those who believe the arms deal is a giant scandal, more chances to shut him down. Hoffman is aggressive and patronising towards Mbeki. It comes at the expense of building a sound argument using clear, focused questions and evidence. Mbeki gets to build his own defence. “We have absolutely no evidence and for the last 16 years… There’s been absolutely nobody who’s presented any evidence at any time of bribery…We’ve been waiting for all these people to say concretely, to say this is the facts we have and I’ve never seen it,” he says. It’s too easy. Under his leadership there was never enough evidence, or any evidence, he says, to institute an inquiry. He says the Sunday Times story on him receiving a R30 million bribe and giving most of it to the ANC and some to Zuma is a fabrication. So too is the story claiming Tokyo Sexwale wanted him to explain the arms deal. A smirk goes around the room when Hoffman shuffles his newspapers. Is that all he brought as evidence? That and a book. There’s also an article on the failure of the arms companies to deliver on their promised R110 million in investments and 65,000 jobs. But all Hoffman uses is another Sunday Times article to prove his point, when the Commission has heard from multiple witnesses. Mbeki jokes with a lawyer. Hoffman asks a long-winded question that lasts a couple of minutes but could be summarised as: did you use the arms deal to further your political career rather than benefit South Africa? It’s ruled as irrelevant to the Commission’s terms of reference. Hoffman cites dubious sources and is shot down by Seriti. The day comes to an end with so many questions unanswered. We know no more about Mbeki’s involvement in the decision to spend so much money on the deal, whether he may know anything about if certain bidders were favoured, and if he personally intervened to prevent investigations from multiple bodies from taking place. Hoffman mentioned all these issues but without evidence, without clarity and with too many statements of his own. If there’s anything that may count in favour of Hoffman and his client Crawford-Browne, it’s how often Mbeki said he couldn’t recall certain events. But essentially, it will be up to further witnesses, mainly whistleblowers, to build the case that the arms deal featured corruption and was a waste. Mbeki also has to appear on Friday morning for cross-examination from Lawyers for Human Rights.